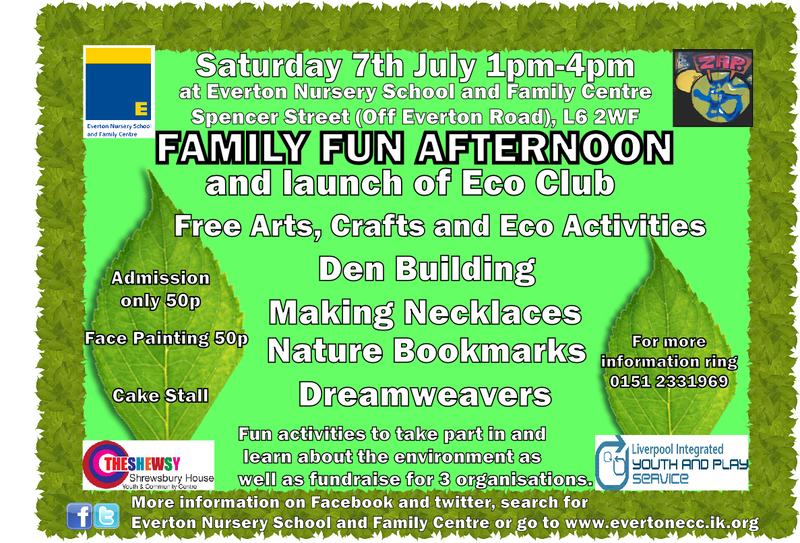 Come along to Everton Nursery School and Family Centre on Saturday 7th July, 1pm-4pm for a Family Fun Afternoon. It will also be the launch of our Eco Club which will be held once every half term. On Saturday 7th July there will be free Arts, Crafts and Eco Activities including Den Building, Making Necklaces, Nature Bookmarks and Dreamweavers. Admission is only 50p and there will be Face Painting, Cakes and Raffles all for a small charge. All money raised will be shared between Everton Nursery School and Family Centre, Zap and Shrewsbury House Youth and Community Centre (The Shewsy). We can’t wait too see everyone after the great success of the previous event at Zap earlier in the year. Want to know more about the uses of social networks and how to stay safe online? Come along to our E Safety workshop. Starting at 9.15am this Friday 22nd June. The workshop is a great opportunity to ask any questions about new technologies, their uses and how to keep safe online. On Thursday 24th May 2012, Everton Nursery School and Family Centre were inspected for the Inclusion Quality Mark. After a through inspection which involved a tour of the building, observations of massages and interviews with staff, parents/carers, governors we were pleased to find out that we have been awarded the Inclusion Quality Mark. Has an emphasis is on practical evaluation – it is firmly rooted in what happens in schools. Involves all stakeholders in the school. Is a usable framework as an evaluative tool. Embeds the concept of a self-evaluation process rather than a series of tick boxes. Is externally assessed and moderated by a highly professional team. Recognises and celebrates the work going on in schools on inclusion. Friday 1st of June saw the unveiling of our new mural. The mural has taken pride of place in our reception area. We’ll get photos and videos up tomorrow!